Dr. Anthony Atala made headlines in April 2006 when he announced that his team had successfully grown new bladders for seven patients with spina bifida, a condition in which the spinal column fails to completely close during fetal development. While healthy bladders maintain a reasonably low pressure as they fill with urine, the bladders of some spina bifida patients generate dangerously high pressures, causing kidney damage. Dr. Atala’s tissue engineered bladders are made of a patient’s own cells grown on a custom mold designed to specifications provided by detailed CT scans of the patient’s pelvis. In podcast #11, you’ll hear Dr. Atala tell this fascinating story of innovation, along with some insight into how the field of regenerative medicine comes together as a community to work on challenges like creating whole organs from cells. Anthony Atala, MD, is director of the Wake Forest Institute for Regenerative Medicine and chairman of the Department of Urology at the Wake Forest University School of Medicine. 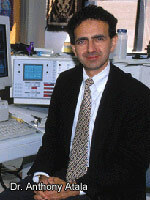 For more information about Dr. Atala’s work, see the institute’s web page. Hosts Leah Kauffman and John Murphy. Interview by Leah Kauffman.